An eight-day trial ending on May 22, 2018, resulted in a guilty verdict for a Montana-based trucking company and its owner for mislabeling and falsifying hazardous materials records. Both defendants were charged with conspiracy, wire fraud, mail fraud, placarding violations, and obstruction of justice stemming from an explosion at an oil and gas processing facility in Wibaux, Montana. The jury deliberated for three hours before finding both defendants guilty of 13 of 14 counts. The one acquittal related to one of the placarding violations. Forfeiture in the case amounted to $644,689.70. On December 29, 2012, a driver for the defendant’s trucking company loaded natural gas condensate (drip gas) from a pipeline station that transports products from oil fields in Montana and North Dakota. Drip gas is a dangerous hazardous material requiring placarding as a flammable liquid. The drip gas was hauled from Watford City, North Dakota, to a slop-oil processing/recycling company based near Wibaux, Montana. The bill of lading for the shipment identified the product as a non-hazardous substance (slop oil and water). A fire occurred as the driver was pumping from the truck’s front tank into the facility. Three employees were injured. The tanks on the truck burned for eight days until the local fire department could determine that they held drip gas — and not slop oil and water as indicated on the bill of lading. Based on witness testimony, the CEO of the company allegedly attempted to cover up the hazardous materials violations by directing the driver to place a falsified bill of lading in the burned-out truck several days after the explosion. 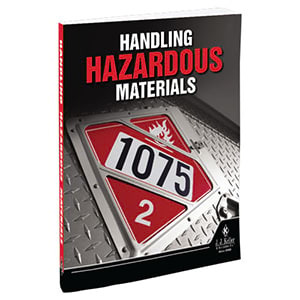 J. J. Keller's Handling Hazardous Materials offers plain-language explanations of DOT hazmat regulations for those who manage or transport hazardous materials.